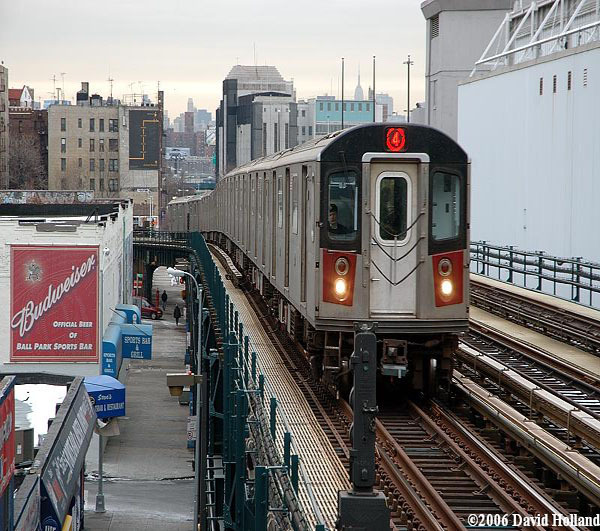 The straphangers have spoken & they feel the 4 train is average! The MTA released the full graded result breakdown of the 4 train for its 2007 rider report card. The highest grade earned was a B- which the 4 earned in four different categories. The lowest grade earned was a surprising D. Overall the 4 graded out with a C.
I mentioned that the lowest grade earned was a surprising D. The reason I said this is because I fully expected the 4 to earn an F for “adequate room on board at rush hour.” Never in my wildest dreams did I expect the 4 to score higher than a F. I know a D is still failing but I think that grade is inaccurate. The 4 deserves a big fat F for this category. I avoid the 4 like the plague in general but especially during rush hours. I swear it seems the only way to get a seat on that line is to get on one of the first couple of stops at either end! The MTA announced they received 4200+ responses to this report card. Once again I am sorry but that number is way too low, especially for a line that is apart of what is the busiest trunk line in the entire system! Where the hell are all the straphangers at? I could stand on any station in Manhattan & count that many 4 straphangers within an hour. This is inexcusable! Will transit workers be able to fill out report cards about passengers. hike. They ride for free too.